The Meris 440 Mic Pre and Ottobit Bit Crusher have found a new home in the studio arsenal of master record producer and songwriter Steve Levine. An industry stalwart since his first work at CBS studios in 1975, Levine has worked with a lexicon of artists from The Clash and the Jags with CBS records to Natalie McCool or 6 Day Riot under his own label Hubris Records. 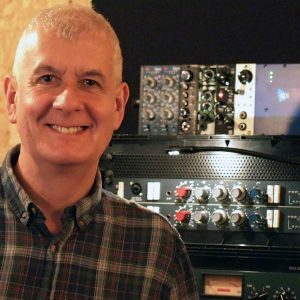 These two new and unique 500 series units are now proving invaluable to the writer and producer of BBC2’s ‘The Record Producers’: “I’ve been using the Meris 440 for a few months now and have found it to be a really indispensable studio tool”, says Levine who regularly avails himself of the 440’s built in effects loop. This recording set up allows virtually any studio mic to be placed in front of the guitar amp to capture the perfect signal with the pre amp but then by inserting a drive pedal in the FX loop allows for creative tonal tweaking with the pedal (or indeed any pedal). This is a really superb method of recording and as far as I’m aware the only product that works in this way. The Meris Ottobit is a 500-series Bit Crusher, again with a host of unique features and sound capabilities. It’s actually designed to be played like a bit of an instrument, capable of creating complex step sequences and modulated, almost distorted de-rezzed sounds from even the most basic of input signals. In the most extreme settings, it often sounds as if the module is creating a brand new sound source. Sample loops can be turned into something totally unique especially if the LFO is set in time with the feel of the loop. For any Meris enquiries in the UK and Ireland contact Sound Network on [email protected] or call +44 (0)20 3008 7530.